While many adults simply view the swim diaper as a convenience for parents who want to avoid subjecting their child to a soggy, wet diaper while at the swimming pool, swim diapers are so much more. The advent of the swim diaper has improved water health and safety at recreational swim facilities and improves the swim experience for swimmers of all ages and sizes. If your child is still in diapers and you're planning on taking her swimming, you're going to want to pick up diapers before you hit the pool. Most public swimming pools require babies and toddlers to be outfitted in this type of diaper if they're going to be in the water. The Centers for Disease Control and Prevention suggest swim diapers can help temporarily contain liquid waste, but cannot promise to prevent leaks of urine or diarrhea. Although swim diapers may be required, you still need to make sure you are changing diapers roughly every hour away from the water's edge. These diapers are specially made to stand up to total immersion in water without bloating the way standard diapers do. Water passes through the material, so you don't have to deal with a soggy mess. A well-fitted pool diaper will prevent baby's stool from leaking into the water and will trap over 95 percent of the accompanying E. coli bacteria from ever reaching the water. This ensures higher water quality for all swimmers and prevents the spreading of bacterial diseases. By preventing stool from entering the water, you're also preventing swimming pool staff from shutting down the swim facility for required clean up. State laws mandate that when solid waste enters the water, swimming facilities must clean the waste before swimmers can re-enter the pool. If the stool happens to be liquid, chances are the pool must remain closed until the total body of water has had a chance to undergo a full filtration circulation - this can take between six and 18 hours, depending on the circulation system a facility has. That's a long time for a facility to remain closed simply because a baby wasn't wearing the right type of diaper. You can purchase swim diapers to wear alone or under your baby's swimwear from most major swim retailers and online swim shops who offer cute designs for girls and boys. You always want to double-check the sizing information before you make your purchase to ensure that the diaper you buy will fit your child. This is especially true when choosing reusable diapers - you can expect to spend between $8.00 and $20.00 per diaper, so you want to make sure you buy the right size. Pool proof diapers are available in disposable and reusable styles. Always check with your local swimming pool to see if they have specific requirements regarding swim diapers before you make your purchase. Disposable pool diapers can be extremely convenient to use. Brands such as Huggies Lil Swimmers are widely available during swim season, and you can usually purchase them wherever standard disposable diapers are sold. Disposables generally come in pull-on styles, but with tear-away side seams that allow for easy removal and clean up. Huggies Lil Swimmers - These standard swim diapers feature easy side-close tabs and come in size 3 for babies 16 to 26 lbs., size 4 for babies 24 to 34 lbs., and 5/6 for babies over 33 lbs. You can purchase a 20-pack from Walmart in any of the three sizes for just under $10. 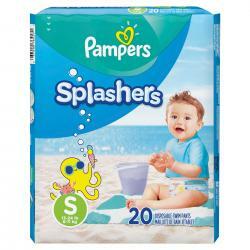 Pampers Splashers - Available in three sizes, these disposable baby swim pants are the pull-on style with a stretchy waistband so they fit like a normal swimsuit bottom. For under $10 you get 17 diapers per pack for size Large, 18 for size Medium, and 20 for size Small from Target. Babyganics Color Changing Swim Pants - Safety is the priority with these unique baby and toddler swim pants. Each diaper features a colorful picture that appears on the front with prolonged sun exposure. The swim pants help you see how long your baby's been in the sun and provide UPF 50+ protection for covered areas. At only $10 per pack, you get 12 diapers with a size Small, 11 with size Medium, and 10 with size Large from Buy Buy Baby. A reusable swim diaper is composed of two layers. The outer layer is made from durable nylon and is manufactured to resist chlorine damage. The inner layer is typically made from flannel or brushed cotton, so it's always soft against baby's bottom. If you're concerned about adding more trash to our landfills, or just worried about finding disposables out of season, then reusable diapers are probably your best option. Be sure to keep several pairs on hand so you can make a quick change whenever baby needs it. i play Reusable Swim Diaper - For $12 to $14 each, parents can opt for the original reusable swim diaper by i play that opens on one side with a series of snaps. Diapers feature three polyester layers that prevent diaper rash and keep messes in. There are more than 25 designs to choose from for boys and girls. This innovative company also sells swim trunks and swimsuits with built-in reusable swim diapers. Charlie Banana Reusable Swim Diaper - With four sizes available for kids up to 55 pounds, these stylish diapers feature two snaps on each side of the body so they can be pulled on or changed like a standard diaper. Each pair costs about $14 and they come in dozens of fun prints for boys and girls. Disposable diapers are not as protective against leaks as reusable diapers are, and many public swimming pools require you to use rubber swim pants over the top of disposable diapers to help prevent leaks. Rubber swim pants, plastic pants, and swim diaper covers are all terms used to describe waterproof diaper covers. Make sure you know the policy of your swimming pool before you arrive on site unprepared. Gerber Waterproof Pants - These plastic swim diaper covers are basic white, covers perfect for use over disposable or cloth diapers. Since plastic swim diapers are out of fashion, they can be difficult to find. You can find sizes from 0 to 3 months and up on Amazon for under $10 per 2-pack. Dappi Waterproof Nylon Diaper Pants - Available in sizes Newborn, Small, and Medium these rubber swim pants from Walmart have a soft waistband and leg openings for optimum comfort. A two-pack costs about $7. Babies aren't the only ones who can benefit from wearing pool diapers. Many older children and adults who are either disabled or experience incontinence problems find that diapers give them the freedom to get back in the water. Typically, diapers for adults use velcro fasteners at the side for easy on and off access. This also allows the diapers to be adjusted a bit for a more comfortable fit. However, pull-on styles are available for those who prefer them. 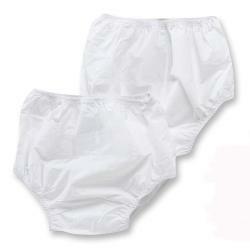 Pool diapers can be worn discreetly under your normal one piece, or trunks so you can swim without worry. Swimmates Disposable Swim Diaper - Available in sizes Small through XL, these disposable adult swim diapers feature a slim fit and tearable side seams. You can get a 22-pack for just under $20. Dr. Leonard's Waterproof Pants - These quiet vinyl swim diaper covers can be worn over diapers of any kind and can be washed. Sizes range from Medium, which fits a 26 to 34-inch waist, up to XL for waists up to 58 inches. A 3-pack of these vinyl pants for older children and adults costs $10. Of course, if you opt for the disposable pool diapers, just throw them away as needed, and use a fresh one next time. Rinse any stool out of the diaper immediately. Turn the diaper liner side out, being sure to re-attach any velcro fasteners to protect them from damage. Machine or hand wash as directed in hot soapy water. Never use bleach since it can be harsh on the elastic. Machine or line dry as directed. Once you understand the importance of swim diapers, consider passing along the information to other parents and adults. Keeping public swimming facilities safe for all swimmers is an important role that everyone must help take part in. If you think you or your child may be coming down with an illness, it's best to stay out of the water altogether, but sometimes sickness comes on quickly and without warning. Wearing a swim diaper can help prevent illness from spreading in the event of an unexpected accident.